It’s no secret that police regularly use social media in the pursuit of criminals, often to help witnesses and victims identify their attacker. Recently, however, New York City police went one step further, using social network Instagram to help bust the largest illegal firearms ring in city history. 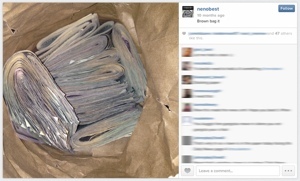 Aspiring New York rapper Matthew “Neno” Best allegedly used the social network to post photo after photo of guns and loose hundred dollar bills – sometimes tens of thousands of dollars at a time. These pictures, along with their captions, led police to investigate Best and a handful of others surrounding him. Naturally, the cash wasn’t coming from album sales: Police say Best was selling silencers, military-grade weapons and other firearms out of his recording studio. The unidentified uncover agent who discovered Best’s alleged activities and Instagram account made an attempt to purchase each and every gun the illegal weapons ring could sell to help keep the weapons off the street. That suggests some of the money that Best shared pictures of online may have come from the police as part of the investigation. In total, police seized 254 guns including two semi-automatic Soviet-era rifles and a fully automatic MAC-11. Nineteen arrests were made in connection to the weapon ring.